In some cases, Members may bring guests but be sure to check before assuming non-Member guests are welcome. Club events include club drives, tech sessions, movie nights, Annual Summer BBQ, Annual Christmas Party. The Club has undertaken a three-year commitment to these bursaries and the first bursaries will be awarded in May 2017. Thanks to the support of members and sponsors we have met our 2016 and our 2017 targets and are on our way towards our 2018 target. Watch for a variety of fundraising opportunities throughout the year where you can get involved in this give-back to our community. Watch for the helmet that will be based around at every event and help out with your spare change. 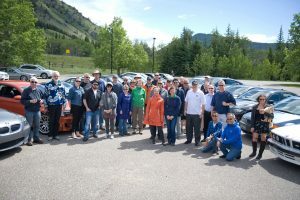 When the third Sunday in June arrives, members shine up their wheels and hit the road for one of the more popular group drives of the year. The route varies but almost always includes some beautiful foothills and mountain driving. A favourite route takes cars and motorcycles over the Highwood Pass from either direction. This makes us some of first vehicles on the asphalt after the winter closure. Wildlife often think they still own the road so sightings of bears, moose or big horn sheep are not unexpected. There are stops along the way when we stretch our legs, compare performance notes and grab a cup of java or other juice. Some of the passengers take video of the ride, others snap photos for the photo contest; still others play games on their devices, read or knit or snack on Twizzlers. The drive always ends with lunch at one of a number of unique venues either in Cowboy Trail country, Bragg Creek or more recently at Rafter 6. This is one of the keenly anticipated club events and is always well attended. 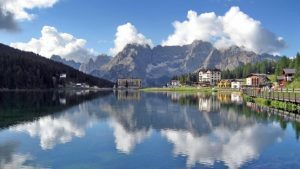 The first multi-day driving tour was a 15-day Dolomites tour in September 2014. The tour included overnight stops at Munich, Salzburg, Misurina, Moena, Innsbruck and Munich. Daily drives and alternative activities kept the participants busy and entertained. Following the tour, the Dolomites group met to share photos and stories. The success of this multi-day tour encouraged organizers to plan a calendar of upcoming tours. Check the TOURS tab to get more information. 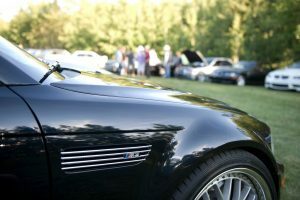 Each August, members and their families gather for the Annual BMWCSA BBQ. The sun almost always shine but just in case, there is a big tent to provide shelter from any showers. Great Events caters a BBQ dinner, slightly different every year, but always delicious. Members take this opportunity to shine up their iron and put it on display. 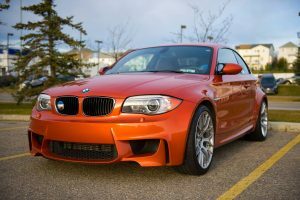 There is usually a viewers’ choice prize for the vehicle that pleases the most attendees and random door prizes for those who vote for their favourite wheels. There are games and prizes for the young crowd including a tricycle obstacle race and pick up soccer games. At the most recent BBQs, the organizers have organized a silent auction of items available for bidding exclusively to attendees. These items are generously provided by our sponsors and advertisers and have included: weekend use of an X5 suitably dressed for a ski weekend, a child’s pedal car replica of a BMW 328 Roadster (sweet), a BMW bicycle, performance suspension parts, BMW golf bag, racing pedals, Pelican torches (bright, very, very bright), clothing and other goodies equally appealing. Bidding for many of the items is fierce. Food is always great, company is always grand and a good time is had by all ages. 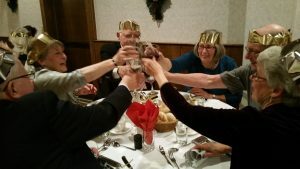 Every November, members put on their party clothes and gather at the Austrian-Canadian Club for the Annual Christmas Dinner. The evening usually starts with a cash bar followed by dinner. Food is always plentiful and tasty, conversations are lively and there is always a bit of car talk for those who can’t do with out it. On occasion there are a few choice silent auction items for last minute gift giving and a door prize for the member in the right place at the right time. It is always a good time and a great way to start your holiday season party circuit. 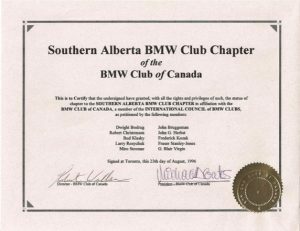 BMWCSA has held photo contests in 2009, 2010, 2011, 2013 and 2016 for members and their family members. Winning photos are used as Newsletter cover art and on the web site. Prizes are occasionally awarded.